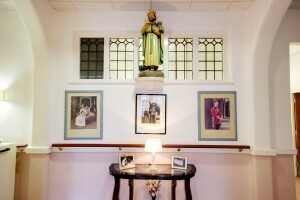 The Home prides itself on the specialist care it is able to provide and this includes palliative and end of life care. This care may involve additional support from the Macmillan Nurses from Meadow House Hospice, Ealing, who are specialists in this area and very supportive. Many residents choose to spend their final days at the Home rather than in hospital and the high level of nursing care provided and the support given by Meadow House enables this to be possible. St David’s and the appropriate ministerial support can be provided from the local community as and when required.